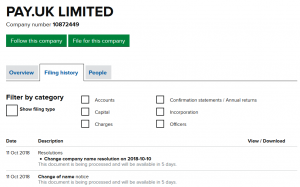 New Payment System Operator Ltd (“NPSO”) has just changed its name to Pay.uk Ltd, a shatteringly unoriginal name and unfortunate in that NPSO was meant to signal a clean break from the previous power structure over the UK payments landscape. Payments UK, the previous industry trade body, scarcely lies cold in its grave (or rather under its re-spray as part of UK Finance) and now we have this new organisation, less the “ments”, and with a meaningful dot. The first wave of UK privatisation in the 1980s ended the likes of British Gas, British Telecom, the Central Electricity Generating Board and the other state monoliths, which were seen as inefficient and unresponsive to consumer needs. UK Payments Administration, the pay-and-rations arm. This concentration of levers over UK payments in turn gives Pay.uk considerable power and influence over the UK economy, over public authorities, businesses and consumers of all types. The only other organisation of power in the UK payments landscape is Mastercard, having both its own payment scheme in which the scheme management and the infrastructure are not separated, and owning Vocalink, the current provider of the infrastructure supporting Faster Payments, BACS and LINK. The LINK scheme management company and Visa look distinctly like also-rans by comparison, and CHAPS is not even in the game any longer, having been “taken in-house” by the Bank of England. Just to refresh our collective memories, the Payment Systems Regulator was established in 2014 to reduce the supposed nexus of power of the five big banks, exercised in the authorities’ view through Payments UK, Vocalink and the four payment scheme companies (five from the point at which LINK had its own scheme company). In this scenario the payment scheme companies competed against each other to some degree. The already-existing ISO20022 Registration Management Group and the new Open Banking Implementation Entity were autonomous or at least quasi-autonomous. Five banks thus supposedly controlled UK payments at one step removed through seven entities, with some influence over ISO20022 RMG at one further step removed, but without control over Open Banking. Now two entities exercise dominant market power over UK payments, and these are Pay.uk and Mastercard, and they control them at no steps removed. If this was not bad enough, Pay.uk’s roadmap envisages increased integration of the payment schemes it controls. The New Payments Architecture plan involves all BACS and Cheque&Credit payments clearing and settling in the Faster Payments system – as well as Faster Payments themselves – thereby reducing or eliminating any competition between these payment schemes, and resulting in one sole underlying retail payment mechanism. All retail payment services become “overlay services” on top of Faster Payments and therefore must conform to Faster Payments terms. ISO20022 XML will be the ubiquitous data format for payments clearing and settlement. These developments can have no other effect than to expand the so-called “Collaborative Space” in which industry-wide definitions are imposed on all market actors, and to consequently circumscribe and limit the space in which innovation and competition can take place – the so-called “Competitive Space”. This is what has happened in the Single Euro Payments Area (“SEPA”) and the SEPA market model is the one that the UK’s roadmap leads towards, only with our version of the European Payments Council (Pay.uk) also controlling both the Clearing&Settlement Layer (by its awarding the contracts for infrastructure provision) and the data standard (by being the ISO20022 XML Registration Management Group), and having a major hand in one of the customer-to-bank channels (Open Banking). The UK’s market model will be more highly integrated than the SEPA one, with Pay.uk at its centre, and with a governance model where control over Pay.uk is split between the Prudential Regulation Authority, the Payment Systems Regulator and Pay.uk’s member-guarantors. These latter are currently three private individuals who are also directors of Pay.uk. Even if that anomalous situation is altered – and the plan appears to be to have 20+ corporate member-guarantors – the governance model is one in which accountability is shared and blurred, which enables Pay.uk to be accountable only to itself i.e. to no-one. For a project that was meant to unravel a supposed nexus of power in the UK payments landscape, Pay.uk has agglomerated a much greater number of levers of power than were in the hands of any single organisation before, and the roadmap is towards greater integration. To that extent Pay.uk’s name is unimaginative but accurate. Since it is not state owned, and since its accountability is de facto to itself (even if de iure it should be accountable to both public authorities and its members), the closest equivalent predecessor to Pay.uk would be a “zaibatsu”, one of a series of industrial/financial conglomerates who controlled significant parts of the Japanese economy from the Meiji period until the end of World War II. Pay.uk has a similar scope of power and indeed over the entire UK economy. It is a thoroughly retrogressive model and should not be permitted to proceed.